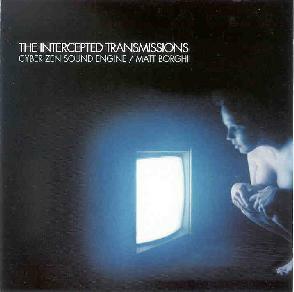 Cyber Zen Sound Engine and Matt Borghi - "The Intercepted Transmissions"
Cyber Zen Sound Engine is a duo from Houston consisting of GraceNoteX and Smith6079, who produce soft space music built around slowly pulsing hypnotic sequences. Matt Borghi is an ambient musician from Detroit whose music redefines the term "minimalist." Being a long distance collaboration between the three artists, The Intercepted Transmissions finds a midpoint between their two sounds. The project began with Borghi recording a series of drones and soundscapes on the acoustic guitar (with numerous alternate tunings) which he sent to the members of Cyber Zen Sound Engine to work with. Grace and Smith sought out the implied melodies in Borghi's work and brought it out with their own style of electronic space music. The result is less of an exploration of space, but more an exploration of the inner self. Rather than urging the listener to gaze out at the cosmos, it turns the focus inwards, searching for the emotional core of the listener. At times, it reminded me of the work of Harold Budd, especially in the gently drifting piano notes of the beautiful Whispering Across Oceans. The Intercepted Transmissions is very quiet music, the kind you can put on in the background and ignore. Yet it remains with you. It adds to your surroundings, giving them subtle shades of emotion and deeper meanings. It will make you feel a part of something. For more information you can visit the Cyber Zen Sound Engine web site at: http://cyber-zen.com. Visit Matt Borghi's web site at: http://www.bgrouprecords.com. Contact via snail mail c/o N-Light-N Records; PO Box 5586; Beaumont, TX 77726.